The inquiry came about after a 2014 Prime Time report discovered five newborns had died in very similar circumstances at the hospital. 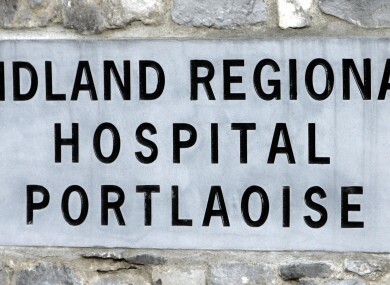 THE HSE USED the threat of legal action against its own watchdog to twice block the publication of a report into the standard of maternity care at the Midland Regional Hospital in Portlaoise. The report was commissioned by former health minister James Reilly after an undercover RTE investigation of the hospital revealed that five apparently healthy babies had died in childbirth at the maternity unit there under very similar circumstances over the last ten years. Reilly’s chief medical officer Dr. Tony Holohan had investigated the baby deaths at Midland Regional’s maternity unit between 2006 and 2012 and deemed the unit to be unsafe. Reports suggest the Department of Health had urged the HSE to reconsider taking legal action against health watchdog HIQA (Health Information and Quality Authority ), which ran the inquiry, not least as if they did so health minister Leo Varadkar would be obliged to side with the regulator. A HSE statement on the matter has clarified their position somewhat. “The Draft Report contained some factual inaccuracies, lacked context and balance and failed to give reasons for or to substantiate certain findings relating to parts of the HSE and/or certain individuals,” it said. HIQA declined the HSE’s offer to meet or to provide further information and supporting documentation to help to respond to the findings. At that juncture the HSE gave consideration to seeking Court intervention in order to ensure that a more balanced and fair final report would ensue. Following a meeting last week, HIQA and the HSE are now working in accordance with an agreed process to receive this necessary information and documentation and to bring finality to the HSE’s input into the process of finalising the report. TheJournal.ie attempted to contact HIQA for comment but have been unable to reach them as yet. Meanwhile, local Laois Fianna Fáil TD Seán Fleming has called for the report to be published. “It is shocking to hear reports that HSE top management are trying to block this report for fear it will reflect badly on them,” he said. Any problems that are identified in the HIQA report must be faced up to by the HSE and adequate steps taken to resolve these issues. Patient safety, the confidence of the public and the morale of staff in the hospital are essential. Fianna Fáil spokesperson on health Billy Kelleher has similarly called for the report to be published immediately. The draft report apparently found that there are fundamental structural problems with the administration of Portlaoise hospital and that senior HSE governance is to blame. HIQA was initially expected to publish its findings next week but has been delayed for a second time. The report will now be provisionally published next month. Speaking to RTE’s Morning Ireland, Prime Time reporter Aoife Hegarty said that the report had been delayed following ‘menacing contact’ between the HSE and HIQA. At a top level HSE meeting last week a plan to place a legal injunction on HIQA publishing the report was one of a number of options considered to prevent the health watchdog’s findings being made public. HIQA’s six-man investigative team finished its fact-finding some time ago. The report has been in legal limbo every since. Email “A report into Portlaoise hospital is being delayed AGAIN as the HSE and HIQA go toe to toe”. Feedback on “A report into Portlaoise hospital is being delayed AGAIN as the HSE and HIQA go toe to toe”.